The less you spend in a given month, the more you have available to pay off loans, whether a mortgage, student loan, consumer loan, or credit card balance. The more money that you can apply to paying off a debt, the faster the principal shrinks. As the principal shrinks, interest charges decrease. The lower the interest charges, the more that payments reduce the principal, accelerating the loan payoff. So, forgoing smaller expenses for a month and delaying larger purchases for several months can benefit your current budget and also boost your financial well-being for the future — if you apply discretionary income to paying off loans. Loans with interest rates of 2% or so may not give you the incentive needed to delay spending. 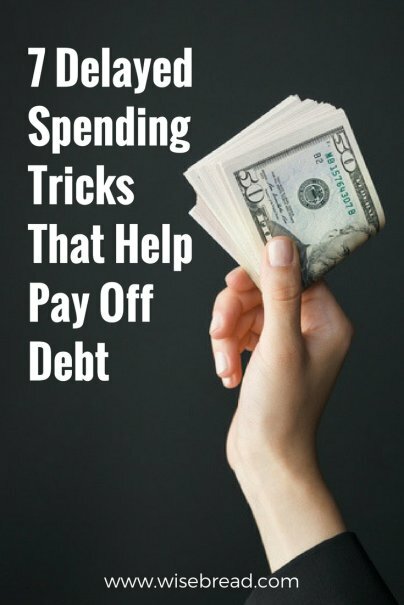 But savings of $30-$200 per month on credit card debt (if you carry balances of $5,000 to $15,000 with interest rates of 7.9% to 17.9%, for example) may be much more motivating. Though you may not be able (or desire) to delay spending indefinitely, you may be able to adopt strategies that allow you to avoid spending as you reduce and eliminate loan balances. Consider these approaches. Buying an item as soon as you want it may mean that you'll pay top price, even if you shop around. Delaying the purchase can get you a better deal through seasonal sales, special offers, or price reductions associated with fashion or technology changes. For example, my teenage son has discovered that while release-date prices on his favorite genre of video games are standard, they are often reduced a few to several weeks later. Previously, he had pre-ordered titles to get them on the release date so that he could reap special bonuses, quickly develop game-specific expertise, and play immediately with his buddies on Xbox Live. In January, however, he decided to stretch the value of his holiday gift money by waiting for a certain game to go down in price. Rather than purchase a modern-day item, satisfy your need in the short term using an old school tactic. For example, I recently delayed the purchase of an automatic dryer despite the ongoing need to clean clothes and linens. Borrowing tactics from my childhood and young adulthood, my family and I washed clothes less frequently, used an indoor drying rack, and took washed-and-rinsed laundry to the laundromat for drying. Such techniques could be applied to other modern conveniences we take for granted. Instead of joining a gym or signing up for a weight-loss program, for example, consider what your parents or grandparents may have done in similar situations. You might start an outdoor exercise regimen or modify your diet on your own. During the first several months of your personal wellness initiative, you could simply establish new habits, taking the time to exercise or cook at home. Later, you could pursue personalized, expert advice for fitness and nutrition. Just because you have a pressing need for an item doesn’t mean that you have to buy it right now. You may be able to borrow from a friend at no cost or rent from a business for substantially less than an outright purchase. This approach lets you test the product, identify useful features, and, most significantly, decide whether you need to make a purchase at all. For example, my family needed a tent to go on a Cub Scouts camping trip several years ago. Although my husband and I enjoy the outdoors, we had never camped as a family, weren’t sure whether such events would be commonplace in the future, and had not acquired camping gear. When a friend learned of our plans, he offered to lend us his equipment. Eventually, we bought a tent. But we were able to delay the purchase for a couple of years. Sometimes, delaying spending involves the simple act of patience. Wait. Then buy. This approach can work for large and small purchases alike. For example, my husband and I waited on braces for our sons. Our dentist urged us to put braces on both of our children when they were in elementary school. Although I grasped that braces earlier could mean avoiding more severe problems later, even the orthodontists we consulted thought that we could safely delay treatment. And, I felt that, in our family, a teen would be more compliant with a strict dental regimen required by braces than a ‘tween. In another situation, I waited to replace some disposal-damaged spoons that are part of my everyday stainless pattern. At first, the holidays seemed like the perfect time to buy new spoons. The utensils would be on hand for parties and I could take advantage of a seasonal sale. Then I realized that I had the essentials and could easily wait until next year’s festivities to make this purchase. Certainly, some purchases, like home or auto repairs, need to be made sooner rather than later. But many can be put off for a year or more. Substituting what you already have for a needed item is another way of delaying a purchase. You may discover that the substitute works fabulously or you may find that it simply offers a stopgap. Substitution lets you delay spending, avoid further temptation, and test whether a modification works just as well as the original. Ingredients in recipes come to mind as everyday items ideal for substitution. In the past, I have rationalized that since I am already cooking at home to save money, it’s OK to spend at the grocery store to pick up one missing ingredient. For me, the problem with this approach is that I will buy the needed item plus several more. In other areas, consider multiple uses of water bottles, tin foil, bleach, salt, bobby pins, and more to avoid buying a specialty product with just one purpose. You can delay purchases by being creative with what you have or uncovering free resources. For example, cook with items on hand, as Meg recommends in her post on a month-long spending freeze. Concoct a dish based on your knowledge of cooking (for example, make pasta with roasted vegetables and cheese, stir fry with vegetables and rice, or make homemade soup). Alternatively, use the advanced search function on allrecipes.com or a similar site to locate a recipe that uses the ingredients you have. Likewise, you might make art for yourself or gifts for a friend with items on hand rather than spending money on supplies or buying a brand new item to give as a present. Finally, you may be able to access free stuff or services, such as free entertainment, healthcare, or meals. Delaying purchases can often do more than defer payments and slow down cash outflows. An occasional outcome of the delay is that you will change your mind and not make a purchase at all. For example, when the holidays were over, my waiting-for-a-price-break son must have realized that his friends weren't playing the video game that he had planned to buy. Plus, I imagine that he anticipated being busy with his schoolwork, Eagle Scout project, and track practice after the Christmas break and wouldn't have much time to play anyway. So, he decided not to buy the game and save all of his money instead. When considering whether to buy now (even for a great deal and limited-time offers), count the cost not only of spending but also of continuing to carry loan balances as interest charges can easily cancel out savings. Even my teenage son, who has grown up with instant downloads and prompt delivery of release-day video games, can wait. That tells me that nearly anyone, including me, can avoid a purchase (at least temporarily) by waiting for a price break or using a combination of delay tactics. Has delaying purchases helped you to save and pay off debt? This article is inspired by the Debt Movement. Join the movement to pay down $10 million in 90 days and apply for loan payoff scholarships. I love the delayed purchasing strategy. Delaying or just pausing, can open the door to a lot of possibilities, including earning extra income to pay for the item and just more time to think about whether or not it's essential. More times than not, you can borrow the item, or buy used and get what you need. We fool ourselves into thinking we must always buy new and even our needs can get distorted. Thanks for your insights. I agree that we often think that we need to buy new, which is often the convenient choice. Waiting to see if something is essential and finding alternative means take more effort. But as you mention if you can earn the money to pay for the item, you can hopefully pay down debt (if you have any) while you are waiting. This is a good way to help distinguish between manufactured wants and legitimate needs. I've been doing the "Delay Purchase" thing the last several months as part of a larger decluttering effort, and as I cycle through some of the tricks you mention (substitute, borrow, be creative), I'm consistently winding up at "Change Your Mind," the greatest declutterer and bank account fattener of all. Thanks for your comment. Since I am not big on shopping, I have tended not to pay as much attention to the needs vs. wants issue but you are right that a delay can help you to sort through what is really needed (and for that matter, what "wants" are long lasting). Good luck with the decluttering effort! Buying less can definitely help with that process and in my case, uncover some items that I had forgotten I had (and therefore do not need to go out and buy again). It's best always if you can wait til off season. Get a gas grill now versus the middle of the summer for example. Off-season buys can help keep costs down. I tend to wait to the end of the season and managed to snag great deals on outdoor furniture (to go with my gas grill) a few years ago by waiting until August or September to buy instead of late summer and early spring. If you don't have the money to buy now, though, you can note when the seasonal sales happen and save up until the next year. Waiting until you change your mind or just sitting on the idea for a couple of weeks is a great way to avoid frivolous spending. Nine out of ten times I wait to make a large purchase I end up talking myself out of it and realize I never even needed the item in the first place! Great post. I like to delay myself if I'm not sure that I want to buy something. Then I'll realize that I can live without it anyway making me save the money instead. Totally agree with stalling or delaying when making purchasing decisions. Though tempted to buy from mail order catalogs (shoes, clothes, household furnishings, etc), I always try to ask myself do I really need this ?? - I quickly assess everything and 9 out of 10 times the answer is no. I'd much rather purge my closets than put more stuff in them ! I wish I had a dollar for every item that was hardly worn or never worn because I didn't like it after all. We delayed a new family room furniture by repairing a cushion at an upholstery shop. We have substituted vintage for brand new in some circumstances, like art, furniture, dishes, cars etc. I've waited for half off clearance sales. If it isn't there, then I can't get it. I always have a price range in which I will consider a purchase. If it gets to that or below, then I can buy it.